Common in arid regions of North America, the ladder-backed woodpecker is the southwestern equivalent of the more widespread downy woodpecker. Small and active, this is an easy woodpecker to spot, but it can be challenging to identify because of its similarity to other species and the variability among subspecies. Markings: Dimorphic species. Males have a buff-white face with horizontal black stripes. The forehead and nape are black and may show streaking, and the crown is bright red but may show stippling toward the front. The throat is buff. The upperparts and wings are barred black and white, and the rump is black. The central tail feathers are black, while the outer tail feathers are white with black bars. The underparts range from buff to whitish and show blurry spots and streaking, particularly on the breast and flanks. The undertail coverts are whitish with gray-black bars. Females are similar to males but have a black crown and a whiter face. For both genders, the eyes are dark and the legs and feet are gray-black. Juveniles are similar to adult birds. Both young genders have red streaks in the crown, though less overall red color than mature males will show. These small woodpeckers prefer relatively arid habitats and are found along creek washes and riparian areas in desert regions. They are often seen in areas with only small plants or scrub growth, and they are also common in towns and suburbs. Ladder-backed woodpeckers are year-round residents of their range. They are found in southern Nevada and southeastern California, throughout southern Arizona and New Mexico, as well as western Texas. To the south, this bird's range stretches through Mexico as far south as the Yucatan Peninsula. Smaller populations are found in Central America as far south as Belize, Honduras and Nicaragua. These birds have a single sharp "peek" or "pik" call note, as well as a harsh, warbling rattle call that descends slightly in pitch at the end. Typical drumming is loud and rapid, lasting 1-2 seconds with each burst. These woodpeckers are generally solitary or found in pairs, though small family groups may stay together in late summer as juvenile birds mature. When foraging, females are often higher in the foliage, while males stay lower and may even forage on the ground for ants. These woodpeckers do not generally excavate extensively while foraging, but will glean, pick, tap or probe to find insects. Their flight is an undulating wave path, and when agitated, males will raise their crown feathers into a short crest. These are monogamous birds. As cavity-nesters, they excavate a suitable nest site either in a dead tree or branch or in a large cactus or succulent such as a saguaro or agave. Nest entrances are generally 3-30 feet above the ground, and males do the majority of the excavation though females do assist. The plain white eggs are oval-shaped or elliptical, and there are 2-7 eggs in each brood. Both parents share incubation duties for 12-13 days, and after the altricial young hatch, both parents continue to feed the chicks for 20-25 days. Only one brood is raised each year. Ladder-backed woodpeckers occasionally hybridize with Nuttall's woodpeckers or hairy woodpeckers in areas where the species' ranges overlap. This hybridization can make proper identification difficult because markings become unclear. These woodpeckers readily visit backyards that have a reliable water source that attracts their attention, such as a bird bath fountain. They will also visit feeders for suet, peanut butter and sunflower seeds. Minimizing insecticide can help provide an adequate natural food source for these woodpeckers, and berry bushes can be good winter food options. 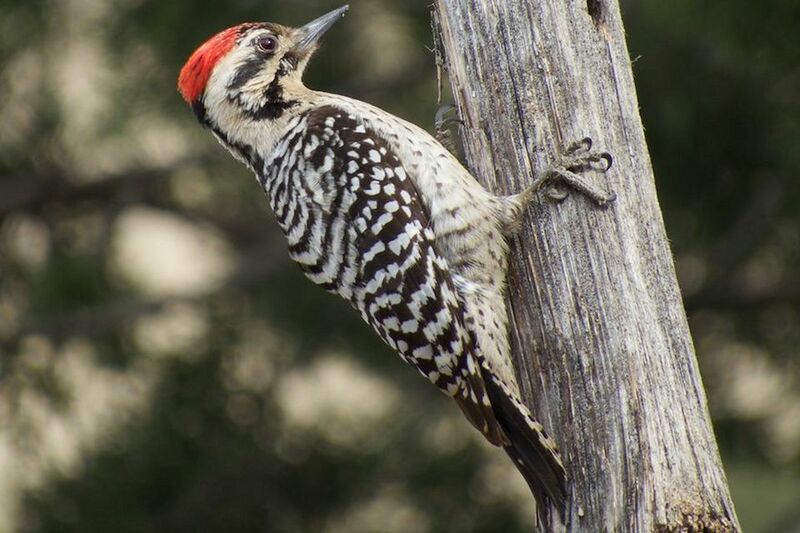 Allowing native cacti to grow to large sizes may attract nesting ladder-backed woodpeckers. Dead trees should be allowed to stand if possible to provide additional nesting sites and foraging opportunities. These woodpeckers are not considered threatened or endangered. Their population is generally stable, though some Texas populations are slowly declining because of habitat loss. Preserving habitat and minimizing pesticide use can help protect ladder-backed woodpeckers. Great Spotted Woodpecker - A Great Woodpecker to Spot!